In the early 1900's, a young man named John Kava left his native Poland and immigrated to the United States, settling in an area of central Nebraska known as Krakow. Located near Genoa, Nebraska, Krakow is a mostly Catholic farming community where many Polish people settled. 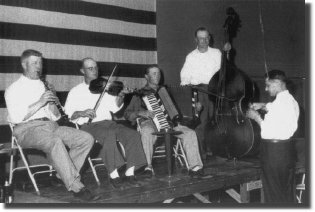 John, who played the violin, and his brother Charles, who played the big bass fiddle, got started playing for events in the area, often accompanied by other local musicians. 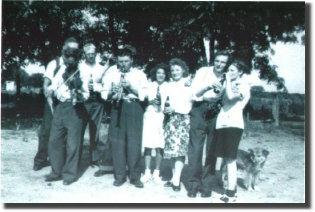 When their parents later joined them in the U.S., their mother, Anna, would go along when they played and sing Polish songs. 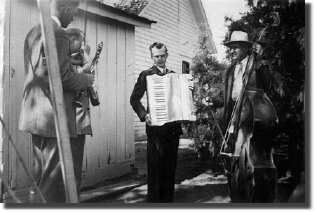 This continued for some time, until in the early 1940's, one of John and Tillie Kava's sons, the late Eddie Kava (Anna's grandson), who also played the violin, teamed up with a very good clarinet player named Emil Olsufka, to continue the band then known as THE KAVA ORCHESTRA. Eddie played for many years, into the 1990's. He was a very talented musician who played by ear, and could play practically any song after hearing it only once. 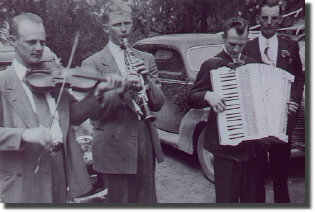 In the mid 1940's, Eddie's youngest brother, Lonnie Kava, another talented musician who plays by ear, joined in on the accordian at the age of 16. 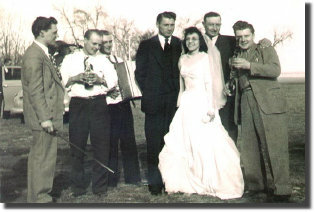 In those days, most weddings were held on farms or at the parents' houses in town. As the guests arrived, they would stay in their cars until the band and the host couple would come to greet them. The host couple would pour shots while the band played whatever song that particular guest wanted to hear. This is where playing by ear was a must, as often times the band had never heard of the song that was requested. Lonnie thinks sometimes the person actually made up the song on the spot! The guest would then tip the band, usually a quarter, (hey, a quarter was worth a lot more in those days) so by the end of the day, the band guys were walking around with their pockets bulging with coins. Got pretty heavy! Also got pretty tiring lugging around those heavy instruments to every car. The Kava's still continue this tradition at weddings by "playing by the door" as the guests come into the hall. Although, we no longer do it for tips, we just do it 'cause we're such great guys! 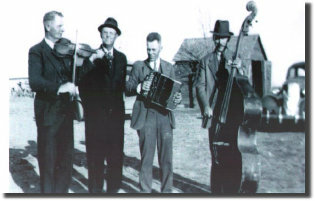 Several years later, Emil went off to the service, then moved to Omaha and started his own band. So, Isidore Cuba joined the band on clarinet. 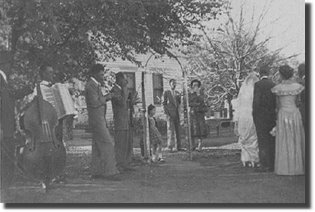 During a trip to play for a wedding in Ogallala, in western Nebraska, Isidore's car broke down, so they had to walk to town carrying their instruments. Isidore spotted an old 1928 Chevy for sale, which he bought for $95. But that old $95 Chevy did get them all the way home! It's interesting that in those days, weddings sometimes lasted two or three days, and were never held on weekends. They were held on Mondays, Tuesdays and Wednesdays. The band played the day before the wedding and started up again the morning of the wedding at the parents' home. Here they played special songs to send the couple off to be married. Tears flowed as the parents gave their blessings. The band would then get a break, which was usually spent harrassing the cooks. All in fun though, and the cooks would give the guys samples of the kielbasa! When the newly married couple and the guests returned, the party was on! Not only did they party till the wee hours, but they even returned the next day to party and dance some more. Ahh, the good old days! During this period, there were several musicians who played off and on with The Kava's. Isidore had to leave the area, so Dan Siemek took over on clarinet. His father Charles, or his uncle Alois played bass. 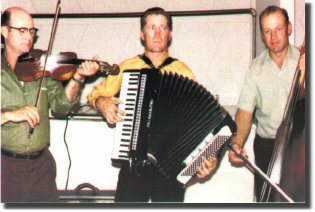 In the mid 1950's, Norman Koza joined the band on accordian, and Lonnie moved to bass. Norman's sister, Diane Thalken, also played for several years on the piano. 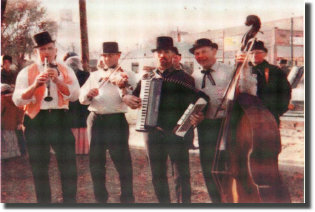 In the 1960's, Dan moved to Omaha, where he played for many years with The Polonairs. 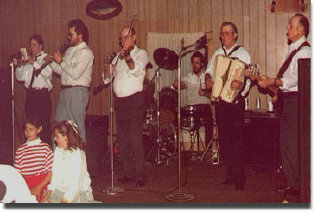 Sil Boro, who had his own band in Ord, Nebraska, and Pete Devaney of Omaha would fill in on drums. 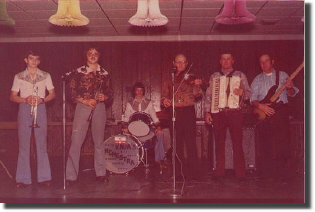 In the mid 1970's, the band got a much needed injection of youth. Lonnie's son, Bill Kava, took over on clarinet. About a year later, Lonnie's youngest son, Kelly Kava, became The Kava's first permanent drummer. In about another year, The Kava's got their first full time trumpet player, Dave Cuba, a relative of Isidore's. All three were teenagers at the time. Dave joined the Navy after graduating high school in the early 1980's, so Norman's youngest son, Brad Koza, took over on trumpet when he wasn't much bigger than his trumpet! Boy the ladies swooned over him!! After playing for quite a few years, Brad moved away in the mid 1990's to pursue employment opportunities, but has since returned to the area and sits in occasionally. To replace Brad, The Kava's recruited their cousin, John Yrkoski, to play trumpet. Having all grown up together as farming neighbors, John, like the other band members, is a veteran of the whole Nebraska Polish music tradition. John also has his own band called The Traveling Musicians. This brings us to today. Lonnie Kava still plays bass. Lonnie has been playing in the band for nearly 75 years! After making fabulous Polish music for over 50 years, the late Norman Koza retired in 2006 due to shoulder problems making it impossible to continue. His musical abilities and leadership were one of a kind, and will be sorely missed. In order to continue, Bill Kava has successfully made a very difficult switch from clarinet to concertina. Kelly Kava plays drums and clarinet (when the band plays "by the door"). John Yrkoski plays trumpet, clarinet and violin. And also to help replace Norman, The Kava's have been lucky enough to acquire the services of John's son, Jeremy "Kuba" Yrkoski on trumpet. Although still a young man, Jeremy is already a veteran musician, also playing in his Dad's band, and has done a truly remarkable job adjusting to the style of The Kava's. 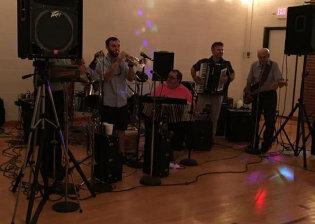 The band has recently finally gotten an accordion back into the mix with the addition of Jim Overfelt of Papillion. Jim has relatives in the central Nebraska area, so is very familiar with the Kava style. 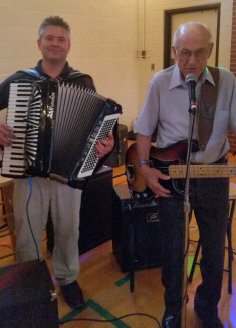 Although only starting to learn accordion a few years ago, Jim has worked very hard and has already become a solid, knowledgeable musician. We are very fortunate he is willing to travel so far and provide such a valuable contribution to our sound. There you have it! 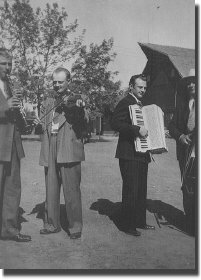 The history of The Kava's Polish Band. We tried to mention all the former members we could remember, and we apologize to anyone we may have left out. We would like to take this opportunity to thank everyone who has ever played with The Kava's, including all the musicians who have just "sat in" for a gig, or a few tunes. We also want to thank everyone who has been kind enough to hire our band over the years, and a big thank you to everyone who has listened and danced to our music, especially the ones who do so regularly. Last and not least, a very special thank you to all our families and significant others for your patience, understanding and tolerating our noisy, expensive and time consuming musical passion. Through all of that they are still our biggest supporters. With the help of all you wonderful polka fans out there, hopefully our future will be as bright and colorful as our past.